The skies today are filled with fixed-wing airplanes, drones and helicopters. Rockets, satellites and even a manned permanent space station soar above the atmosphere, extending humankind's climb away from Earth's gravitational pull. Yet, 100 years after the debut of aviation pioneer Glenn Curtiss' Autoplane in 1917 and the countless unfulfilled promises of tinkerers, the car remains maddeningly stuck on the ground. So why, exactly, has this one early transportation dream remained so frustratingly out of reach? To this point, it's been the engineering — insufficient power-to-weight ratios and the scarcity of lightweight composite materials, for example — as well as difficult regulatory hurdles associated with both experimental aircraft and the automobile. But perhaps for the first time in a century, the contention that flying cars are "just around the corner" might not be so far-fetched. Uber said this month that it plans to have flying taxis in Los Angeles, Dallas and Dubai by 2020, and it's partnering with NASA to create a special air-traffic control system. Volvo Cars' Chinese owner, Zhejiang Geely Holding Group, last week completed its purchase of Terrafugia, a startup that claims to have developed the first "practical" flying car. "I don't think it's being held up anymore," said Pat Anderson, director of Eagle Flight Research Center at Embry-Riddle Aeronautical University in Daytona Beach, Fla.
Anderson says the cutting-edge technologies and trends driving the automotive industry — hybrid-electric powertrains, super-lightweight composite materials, autonomous driving systems, shared-ownership models — also are pushing development in light aircraft. Coupled with a massive easing of aircraft development regulations that only went into full effect Aug. 31, the "flying car," or something approximating that long-held dream, is finally within reach. And not only is it achievable, big players are moving to make it happen, and relatively soon. "The engineering is possible today," Anderson explained, with one big caveat: "What everybody is calling a flying car in the media does not go down the road and has no wheels." "It means [a vehicle that] is going to replace the car, in some instances," Anderson said. "It doesn't mean it will be a plane that's going to drive down the road or park in your garage." Since Curtiss Aeroplane and Motor Co. first showed its Autoplane prototype in 1917, most of the development work on flying cars has been focused on vehicles that might more accurately be called "roadable airplanes" — that is, they can be flown and then later driven on a road. With few exceptions, most of these have been winged two- or four-passenger vehicles. 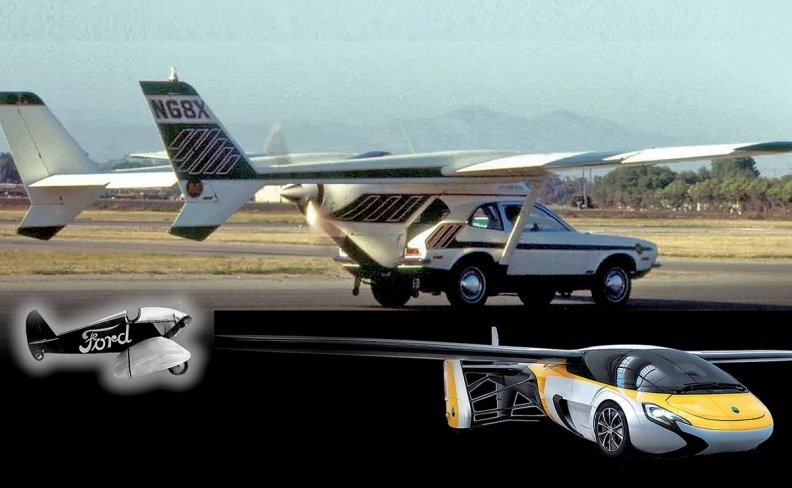 Like the Curtiss Autoplane prototype, many of these roadable airplanes — the Terrafugia Transition and AeroMobil are modern examples — have employed mechanisms that allow the wings to retract or fold when the vehicle is on the ground, making it narrow enough to navigate in traffic with other cars. But there have always been baked-in problems with this type of design, including excessive noise, safety concerns, the need for runways and the need for a pilot's license. There is also the requirement to meet rigid aviation safety regulations as well as nettlesome and costly automotive safety regulations. Those compounded requirements have proved burdensome, to say the least, for some inventors. Take 80-year-old Canadian engineer Paul Moller. He's been chasing the dream of a flying car for over 50 years and developed the M400 Skycar, a vertical takeoff and landing vehicle, that made its first test flight in 2003. Moller explained that stringent automotive safety regulations were the reason his Skycar design had three wheels instead of four, classifying it as a motorcycle under federal law. "If you've got to deal with the crash-protection issues of the automobile, forget it; you're never going to fly it," Moller explained in a 2004 TED Talk. "If you're going to fly like that, you're not going to spend much time on the highway." If history proves anything, it is that cars and planes probably don't mix — except in the minds of inventors. "The smashing together of a car and an airplane makes neither a good car nor a good airplane," Embry-Riddle's Anderson said. "We could definitely make a flying car — but that's not the hard part," Tesla CEO Elon Musk told a London audience in 2014. "The hard part is: How do you make a flying car that's super safe and quiet? Because if it's a howler, you're going to make people very unhappy." Among the most likely to arrive first: point-to-point autonomous airborne ride services that one might employ to travel, say, in New York between LaGuardia Airport in Queens and a landing pad in midtown Manhattan, bypassing gridlocked traffic. Such vehicles likely wouldn't have wheels or spend any time on the streets. Instead, they would fly distances of about 25 miles or less (making important variables such as weather more predictable), be electrically powered with multiple rotors and fly completely autonomously. "The way helicopters pick up rich people and take them from place to place out of traffic? That's what you're going to see, except with drones," said Don Hillebrand, director of the Center for Transportation Research at Argonne National Laboratory in suburban Chicago. "It may not be five years from now, but it will happen." At this year's Geneva auto show, aerospace giant Airbus teamed up with Italdesign, an automotive design and engineering firm, to display a concept called the Pop.Up. It comprises an enclosed, two-seat, carbon-fiber pod that autonomously attaches to either an eight-rotor flying module or a four-wheeled ground module, depending on where the passengers need to go. Both modules would be battery-powered, the two companies said, and each module would return to its charging station when not in use to juice up and await its next call for service. "I think, right now, the urban sky is quite underutilized, and that's exactly the proposition," said Mathias Thomsen, general manager for urban air mobility at Airbus. "The gridlike layouts of roads doesn't actually do it for us. We think that by combining air and ground, we will get a much better use of the space than we have in our cities." Thomsen said Airbus' appearance in Geneva, its first at an auto show,, was "a reach-out to the whole automotive sector, which we see coming closer to us in the development of urban air-mobility vehicles." He said the vehicles that do make it to market "are going to be small, just like the automotive sector is used to, but underneath, they're going to have to be safe and reliable to fly, which is what we're used to." Terrafugia, which was founded in 2006 by a group of Massachusetts Institute of Technology graduates and will remain in suburban Boston under Geely's ownership, says it's close to finally launching its first product. It's aiming for a 2019 introduction of the Transition, a folding-wing two-seater that it displayed at the 2012 New York auto show, followed by a vehicle capable of vertical takeoff and landing in 2025. Uber, meanwhile, after broaching the idea a year ago, now says it aims to demonstrate aerial taxis in several cities by 2020 and launch a full network in 2023. By the time Los Angeles hosts the Olympic Games in 2028, customers will be "making heavy use of air travel," said the company's chief product officer, Jeff Holden. Hillebrand, a mechanical engineer who worked for Chrysler and DaimlerChrysler between 1983 and 2004, said worsening urban congestion is the motivating factor behind development of airborne autonomous passenger vehicles. A former president of SAE International, Hillebrand recalled a society meeting in Sao Paulo, where a six-mile commute by car took two hours. Technologies being developed by and for the automotive industry, he said, are what will make these vehicles fly. "With fully autonomous driving, once you crack that, you have a completely safe car that can't crash into another car," Hillebrand explained. "And once you have cars that can't hit each other, you don't need all of these [automotive] safety standards." But it won't reduce the number of people who need to get from Point A to Point B.
Overcrowding, Hillebrand said, "is much harder in a two-dimensional space on the ground than it is in a three-dimensional space in the air," where vehicles can move side to side as well as up and down to avoid collisions. "So when you solve that dream, you've changed the way cities look." The other big driver is battery technology, specifically energy density, Hillebrand said. "The calculations we've done so far indicate that we need about a fivefold increase in battery energy density, to about 1,000 watt-hours per kilogram. The good news is, we're improving at 3 to 5 percent a year, so with the power of compounding, we'll get there some day relatively soon." "The main reason these vehicles will have limited range, probably 25 miles or so, is that if you go much further than that, you can't really guarantee what the weather is going to be like, and icing becomes a problem," said Anderson, the Embry-Riddle professor. Hillebrand agreed: "I doubt we're ever going to be able to control that."